The "Haagen-Smit Prize", first launched in year 2001, is designed to recognize outstanding papers published in Atmospheric Environment. The goal of this prize is to showcase the excellent science that has been published in this distinguished journal and to further attract outstanding future research. The Prize is named in honor of Prof. Arie Jan Haagen-Smit, a pioneer in the field of air pollution and one of the first editors of the International Journal of Air Pollution, a predecessor to Atmospheric Environment. The "Haagen-Smit Prize" is given annually to a maximum of two papers published in Atmospheric Environment and covering different science areas. The "Haagen-Smit Prize" is given annually to two papers previously published in Atmospheric Environment and covering different science areas. Final selection is made by an international committee of 7-10 people familiar with the subject area. Membership of this committee changes on a rotating basis but every effort is made to cover the wide scope of papers published in Atmospheric Environment. To be considered for the "Haagen-Smit Prize," a paper must be nominated by someone knowledgeable in the subject area. Self nominations are not acceptable. The nomination should be submitted to the chair of the selection committee (Prof. Roy Harrison) before August 1 every calendar year, preferably by electronic mail. See the following website for more information. 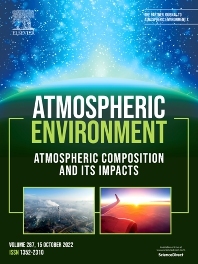 The entire scope of Atmospheric Environment with papers from local to global scales dealing with both science and policy issues are open to consideration. No limit is set on the publication date. Nominators should fully support the reasons for their selection in a compact memo of less than two pages. The committee is looking for papers that have had a significant impact in their field. The "Haagen-Smit Prize" honors its recipients in multiple ways. It confers on its winners (all authors) a plaque from Elsevier. A picture of the authors along with a summary of the nominating letter is published in Atmospheric Environment. Elsevier presents both winners with a cash prize of $1000 USD. Where there are multiple authors of the winning papers, the $1000 USD is either given to the corresponding author in full or split equally between a maximum of 2 authors per paper. Prize of $1000 USD per paper. All Haagen-Smit prize winners receive a certificatefrom Elsevier. A picture of the authors along with a summary of the nominating letter is published in Atmospheric Environment.